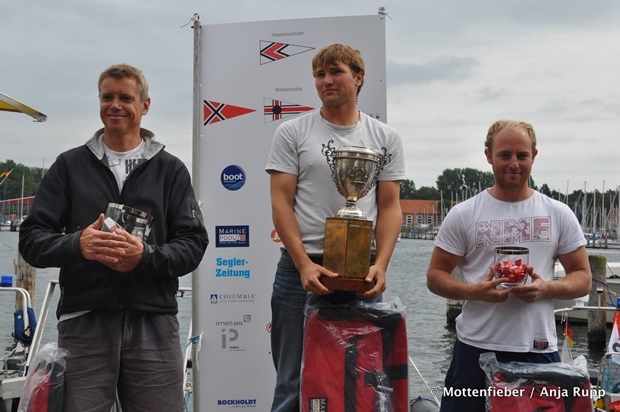 This year's International Moth European Championship was held as part of Travemunde Woche in Northern Germany. 38 boats from across Europe (and one Aussie import) competed in a mixture of conditions, from marginal foiling to 20 knot gusts and big waves, which made an excellent test for the sailors and their equipment. Brit sailor Chris Rashley put on a dominating display of mothmanship in his Aardvark-built Ninja, winning seven races and discarding a second and third position. This is Chris' first season in the moth and he's worked very hard to get to the front of the fleet with a very professional approach to his sailing.